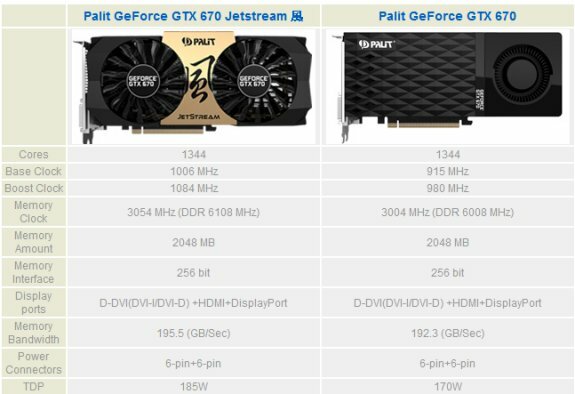 Palit introduces two GeForce GTX 670 cards; a regular model and a JetStream edition. The latter one features a custom cooling solution, a 1006MHz core, 1084MHz boost, and 6108MHz memory. Palit Microsystems Ltd, the leading graphics card manufacturer, has unleashed the GeForce GTX 670 graphics card. It taps into the powerful Kepler architecture to deliver faster, smoother, richer gaming. It’s more than state-of-the-art technology and features. It’s truly game-changing performance. Following with GeForce GTX 680 JetStream – that introduces innovative custom cooling and optimized overclocked capabilities to deliver the ultimate gaming experience, now continuing to represent the exciting new series is the Palit GeForce GTX 670 JetStream, which offers incredible overclocked performance, low noise emission, as well as a powerful cooling design for efficient heat dissipation. When it comes to overclocked performance, the Palit GeForce GTX 670 Jetstream is integrated with DrMOS, which is a suite of optimized multi-chip power stage modules designed to offer high current circuitry, low noise levels and low heat emission. And the optimized design that ensures stable voltage supply, it’s no wonder the Palit GeForce GTX 670 JetStream is capable of transforming your PC into a visual powerhouse! Worthy of its Jetstream moniker, the Palit GeForce GTX 670 Jetstream comes equipped with two 90mm fans that are strategically placed to draw heat away from the PCB. All dual TurboFan Blade fans are designed to generate powerful air stream and air pressure. Though the Jetstream series offers a powerful cooling system, it by no means generates a large amount of noise. In fact, the Palit GeForce GTX 670 Jetstream is 7°C cooler and 3dB quieter when compared to reference cards. Not only the GeForce GTX 670 JetStream, Palit also provides another custom design GeForce GTX 670 with new thermal cooler. Adopted with DrMOS and its new thermal design, which can ensure the extreme overclocking performance and stability. With its stunning Diamond check thermal outlook design, Palit GeForce GTX 670 offers gamers additional outstanding options to experience groundbreaking gaming performance. he 9CM-9CMSmart Fan system consists of dual fans with alternating blade rotations. Each adjacent fan rotates in a different direction to reduce airflow conflicts and effectively improve overall cooling performance.